Read the Goodreads description here. The characters were beautiful; the story was beautiful; the writing was beautiful. It was just beautiful overall, and I loved it. And is relation to chocolate was probably what made it so incredible and beautiful. Everybody knows what it’s like to have a craving for chocolate, and the mixed feelings of guilt and pleasure you have after eating it. Well, this book was extremely similar. It was hard to read it all in one sitting; it was just too rich for my brain, but I couldn’t stay away for too long. I would literally crave the author’s writing, and the storyline. Weird, isn’t it, how this book about chocolate acted as though it were chocolate? A spiritual chocolatier would probably explain it as chocolate for a reader’s soul. But anyway, it was brilliant. The story was cute and easy to read, but also had just the right amount of drama and scandal to entrance me. And the magical aspect of it was also amazing, though confusing – so it was spot on. Magic is supposed to be confusing and awesome, not like Disney fairies waving their wands and granting wishes. Magic is complex and complicated and crazy, and the author managed to write those aspects in almost perfectly. One last thing: the ending. Oh my word I could just die. It was perfect. It made my life. I almost cried I was laughing so hard. 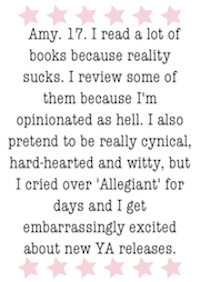 But no spoilers, because everybody actually has to go read this book.